If you already own and Figaro and want to turn it from a great classic into a stunning automotive icon then read on. Our award winning restored Figaros hold their own at classic car shows alongside million pound marques such as Ferraris, Porsches and Bentleys. The feedback we receive is always complimentary. We transform our customers’ cars from average to outstanding with all aspects of the restoration performed to the highest of standards by our dedicated teams of technicians. On top of our world renowned Figaro restoration skills we have two unique tools we use to help owners with their cars. We have a base line 50 point program which was developed on our first bespoke cars. Current owners have the opportunity to use this as a menu, as well as the plethora of extras we can offer. Each car is unique so we offer a bespoke, tailor made package to suit each car and budget, whether that be mechanical work, preservation work, or in depth restoration. 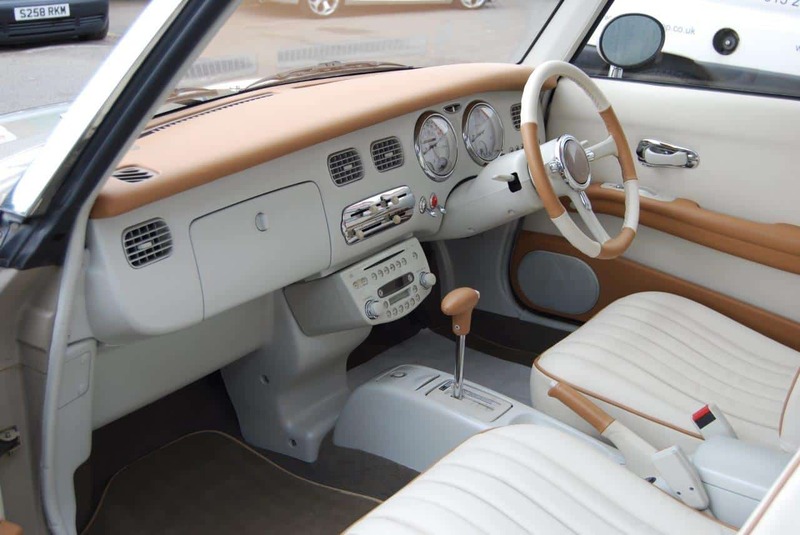 We have over 60 years combined experience working with the Nissan Figaro and our cars are truly within a league of their own. Many restorations begin with our unique Free Figaro Evaluation Report. The customer brings in their car for a full exhaustive inspection checking every aspect of the car from general mechanical up-keep to the condition of the bodywork and chassis. The customer is given a fully customised multi media report detailing every aspect of their Figaro and where it can be improved. They receive access to an online portal with a section by section report including video, a traffic light style warning system and itemised quotes. The 50 step Nissan Figaro refurbishment programme gives us a baseline to our unique restoration process. We challenge you to find any restoration as thorough as ours. When we replace parts it is because they show signs of wear, and because we know the tendency of Figaro weak spots. So our programme includes what we feel is necessary for all Figaros and is not simply an exercise in replacing parts.